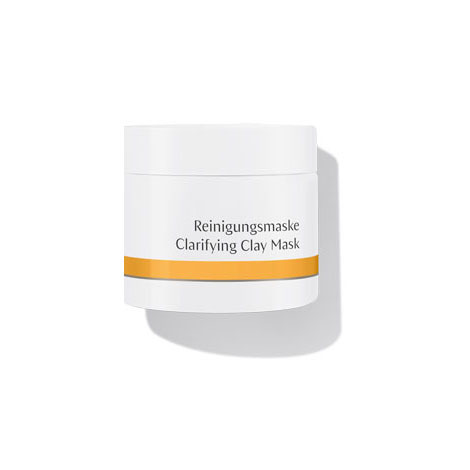 Clarifying Clay Mask deeply cleanses, invigorates and clarifies the skin. Particularly ideal for calloused, large-pored, blemished and oily skin. Formulation: Loess clay with nasturtium and witch hazel actively binds with and loosens dirt particles, lifting and drawing them from the skin. Blackheads are softened, skin is soothed and the appearance of redness and blemishes is diminished. For all skin conditions, especially blemished skin prone to inflammation. Use once or twice each week. Blend approx. 2 heaped teaspoons of Clarifying Clay Mask with an equal amount of water to create a smooth paste. Smooth onto the face, neck and, if necessary, décolleté. Avoid eye area. For normal, blemished and oily skin, remove after approx. 10 minutes with plenty of warm water or a damp cosmetic sponge. For skin which tends to be dry and sensitive, apply Clarifying Clay Mask more thinly and gently remove after 3–5 minutes. Optimally prepare your skin for deep cleansing with Clarifying Steam Bath. This is my number 1 product. It helps clear my oily skin and makes it feel soft. It also helps my sister who has sensitive/red skin look much better! Love this mask - not too heavy, feels very clean and simple and very easy to mix. Skin feels good, whilst the mask is on and afterwards. Does draw out impurities. I love the fact that this is a powder and you add a little water to bring to life. Leaves my skin radiant every time. My problematic skin is soothed so much by this mask, I use twice a week. Have been using for a few weeks now and my open pores have improved so much and redness is reducing. Used the Clarifying Face Steam first then applied the Clay Face Mask which I felt was very soothing and cooling then followed with Calming Face Mask. Face felt calmer and soothed. Would recommend. Very good a little goes a long way and it clears blemishes leaving skin lovely and soft. Complete your personal skin care regime with a complementing mask from our intensive skin care range.